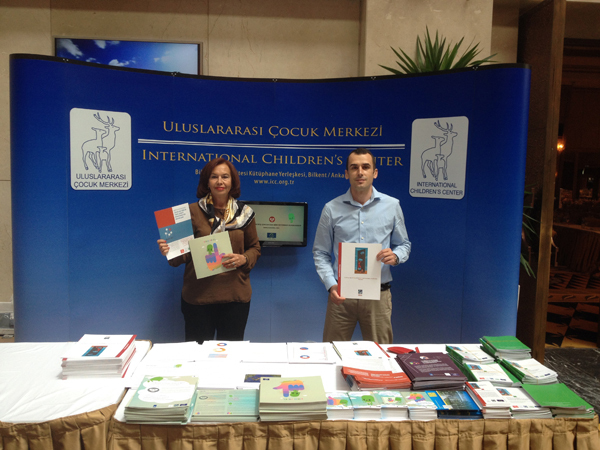 International Children’s Center (ICC) opened a stand to promote its activities at the Assembly Meeting of the Union of Municipalities of Turkey (UMT) which took place on 4th of June 2014. Participants comprised of over 700 Municipality Mayors and Councillors from all over Turkey showed a great interest towards materials of Council of Europe One in Five Campaign (Protection of Children against Sexual Exploitation and Sexual Abuse) run by ICC since June 2013. A number of municipalities demanded to have the campaign in their cities and towns. Ms. Gaye Doğanoğlu, Vice-President of the Congress of Local and Regional Authorities of Council of Europe, visited our stand and paid tribute and gave support to our efforts in the campaign. We have found this opportunity to reach Mayors and Councillors all over Turkey at the meeting with the support of the Directorate of External relations of UMT. We consider these newly established networks and cooperation will greatly contribute to end sexual exploitation and abuse of children.